Our small, agile task forces of dedicated software engineers are quick to grasp our client’s specific needs and are passionate about delivering rapid, innovative, well-informed solutions to the most stubborn of problems. 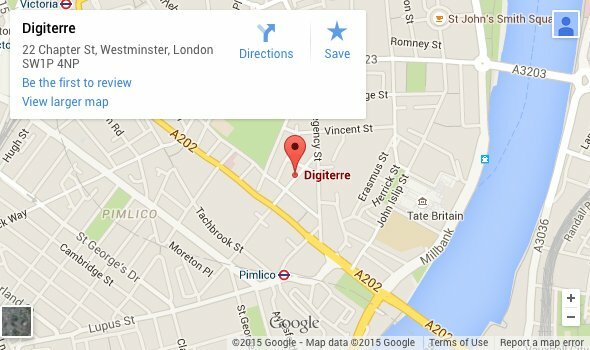 Digiterre provides software products and enterprise software development services to a range of business sectors and particularly the Investment Management, Banking, Commodities and Energy Trading sectors. Our clients include many of the world’s largest Banks, Hedge Funds, Asset Managers, Fund of Funds, Fund Administrators, Prime Brokers and Energy & Commodities Trading firms. Keen to share their wealth of knowledge, our teams are highly experienced in working for complex organizations, solving complex business and technological challenges. Our areas of expertise include solutions to improve the way companies manage data, risk and portfolios; trading applications and quant modelling technology; and systems integration. Over the years, we’ve come up with ways to enrich trade data; bypass manual data entry; automate trade confirmation processes; and customize charting tools. We’ve combined live market data feeds with in house analytics models; built secondary market trading systems; created risk calculators and modelling platforms with full Monte Carlo simulation functionality; and designed valuation at risk software. Other custom-made solutions have included automated position rebalancers; blotters combining data from voice and electronic trades; and mark-to-market analytics systems. Every project we undertake is, by its nature, unique. We are well equipped to deal with the new, the unexpected and the unknown. We continuously talk to and seek feedback from front line staff as we build our solutions ensuring end users have maximum input, identify any shortcomings early on and get a product they will want and need to use. By bringing some of the best software developers in the business to a problem, we are able to find answers that have often been eluding our clients for years. We'd love to talk to you about any projects you've got coming up. You can contact us by phone, email, social media, or just pop in for a coffee.